Another month has passed. Another update. 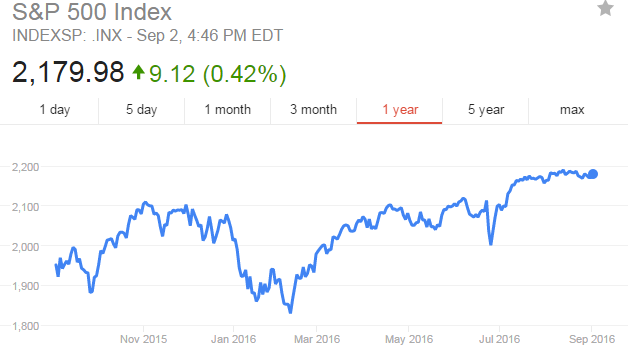 The portfolio in August has stayed relatively flat. 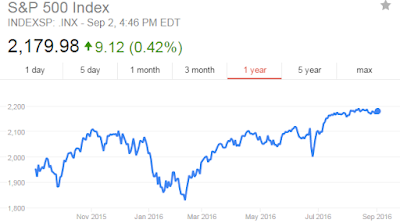 The S&P500 similarly has stayed relatively flat. My dividends have been growing and my portfolio doesn't increase constantly but overall it is at a very high level compared to previous months. Most of the growth can be attributed to my weekly contributions; however, the large run up since March until now certainly has helped my portfolio's total value. I am not as concerned about my portfolio's value as much as the dividend safety. As a dividend growth investor, I am more concerned about how much money I can rake in each month from dividend checks. And how much this dividend payout grows year after year by itself. It's all about dividend payout, dividend growth, and dividend safety. Price is just gravy since I plan to never sell my assets unless the business fundamentals have blown up. Price will take care of itself as dividends continue to increase and the payout is healthily covered. This is similar to owning a business or owning a rental property. There is no need to know how much my factory's current market value is worth or how much my rental apartment is worth on Zillow as long as my ultimate goal is to collect fat checks every month after producing my goods and services. My goal is to ultimately be able to live off of my dividend. I want my dividends to grow by themselves without me having to contribute. Each company needs to continue increasing its dividend year after year. This is why I invest primarily in dividend aristocrat companies or companies with over 25+ years of continuous dividend increases. These businesses have survived more recessions than one can count off the top of their head. The strong often get stronger. Those that have survived through the tough times come out tougher. I want to own businesses with experience and resilience, not the hot fashionable new guy on the block. I hold a diversified basket of high growth low yielding dividend paying stocks and also a group of lower growth but higher yielding dividend paying stocks. Overall, the two types average out and I get around a 2.7% yield at a 9% dividend growth per year. This is a total income growth hitting close to 12% a year. Since I am in the accumulation phase and am no where near retirement, I contribute heavily into my portfolio. Nearly all of my income growth right now is due to my weekly contributions. As the portfolio gets very large such as in the 7 figure range, my weekly contributions will be begin to be dwarfed by the portfolio's daily gyrations and monthly dividend checks. 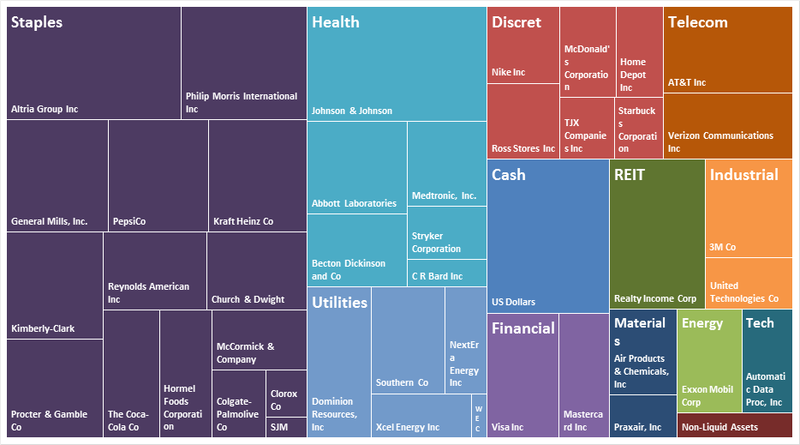 Right now, my portfolio is largely composed of Consumer Staples, Healthcare, and Utility companies. I plan to keep that going forward since these companies have the most stable earnings and dividend histories compared to the other more cyclical sectors such as Consumer Discretionary, Industrials, and Energy. I believe in diversification across all sectors so I do indeed continue to add when appropriate into other sectors. I am planning to continue increasing my weightings in utilities. My weighting is still lower than I like and for next week I am planning on purchasing NEE, XEL, SO, WEC, and WTR. Utilities have fallen out of favor recently and have started correcting. I hope the correction continues and I am adding on the decline as it's one of my favorite dividend growth categories. Utilities are regulated and the business is incredibly stable. Even during recessions, residents will still continue to pay for their electricity, gas, and water bills. Utilities are monopolies. Americans have no choice between service A or service B. It's take it or leave it. Americans must pay or your family doesn't get water. Otherwise, modern life in America is realistically not possible. 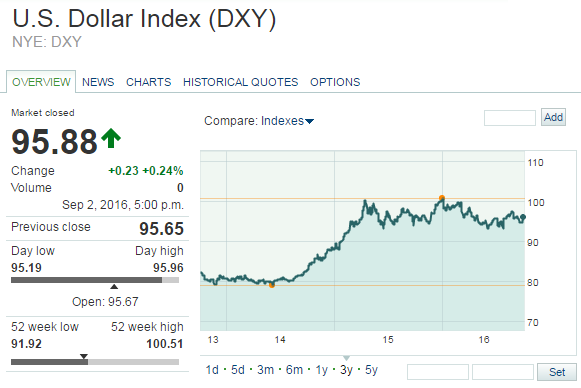 Utilities are also sheltered from the strong dollar and foreign instability. Unlike my multinational companies like Coca Cola, Philip Morris, or Colgate Palmolive, my utility companies are only based in the USA and serve USA residents only. It realistically has nothing to do with Brexit or the economic disaster of Venezuela. I have increased my stakes in Altria, making my investment in the Marlboro brand around $25,000. Altria has recently announced an 8% increase in its annual dividend. PM will announce its dividend shortly, but I am expecting a very low increase for PM due to the effects of the strong dollar. Super Core positions are positions that I consider core and also have incredibly strong balance sheets as rated by Value Line and S&P. Core and Super Core positions occupy the large majority of my portfolio. I have only a very small position in Supporting and Speculative positions. During a major downturn, I can be comfortable holding Core positions but Speculative positions will likely be candidates for selling. The highest quality companies are Super Core. These names are very established best of breed names such as Johnson & Johnson, Coca Cola, 3M, Pepsi, Colgate Palmolive, Abbott, and Kimberly-Clark. It is very important as a dividend growth investor to continuously hold one's companies even during the hardest of times. The power of dividend growth and dividend reinvestment is what grows returns exponentially. Although I have not been through a major downturn yet such as the one in 2008-2009 , I have attempted to ask myself "what would I do with this company if it fell 50% overnight". For best of breed names such as JNJ and CL and PEP, I wouldn't hesitate to add more. For speculative positions, I am not so sure. That is why I have a much larger weighting in high quality. My current net worth progress is chugging along smoothly. There are bumps here and there from market movements, and sometimes my net worth spikes up after a bonus or a tax return. But overall, I seem to be able to follow my predefined goals. Climbing will be much harder in the coming years since I am expecting my portfolio to help in the heavy lifting. In order to get to my $1,000,000 target, I need both the help of my dividend growth companies and my own contributions. From 2014 to now, my growth has been largely from paycheck after paycheck. Going forward, I want my dividend paying companies to become larger players in my net worth growth. I am shooting for around $270,000 by the end of this year. Stay tuned for next month's report. Love the graph of net worth on the bottom. Really puts into perspective your goal and what is needed. Nice portfolio as well, we own many of the same names. You just own 5 times more than I. :) Thanks for the update! You will hit your goal in no time at all it just takes patience and perseverance. Good work young dividend. 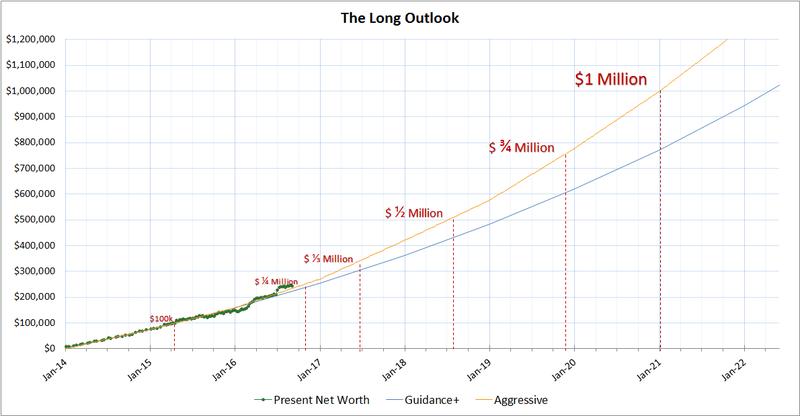 I too enjoy the long outlook graph. Looks aggressive but you've stayed on pace thus far. Great work! Looks like you have a well laid out plan and a contingency plan in case of a huge drop in the market. It is always good to play out those "What if" scenarios in our heads... that way if they do happen we already know how we should react. Keep up the good work and thanks for sharing!